- There was a moment near the end of Erwartung when I began crying from a pain and joy that I could not mentally comprehend; it seemed to indicate that the deepest emotions can be reached through the body as well as the mind. (Bronwyn Draine). Contact between stage and the score is further enforced by Rebeccca Blankenship's imposing performance as the Woman: she nurtures her phrases, never makes do with hysteria, and sustains the dislocation form the surrounding events that the production seems to require from her - the sense that she is wondering through actions remembered. As the lone Character of The Woman Rebecca Blankenship gave a performance of explosive intensity with almost every word audible. (Bob Crimeen). ..oder Rebecca Blankenship, die in die Titelrolle der Schostakovitsch-Oper ein Maximum and Gestaltungskraft plus Persoenlichkeit einbringt und Stadtheater-Routine auf ein Minimum reduziert. ...Lupe dies on the flight to liberation, leaving behind a baby boy who winds up being adopted by the opera singer Ada (an intensely affecting Rebecca Blankenship) who was on the same aircraft. 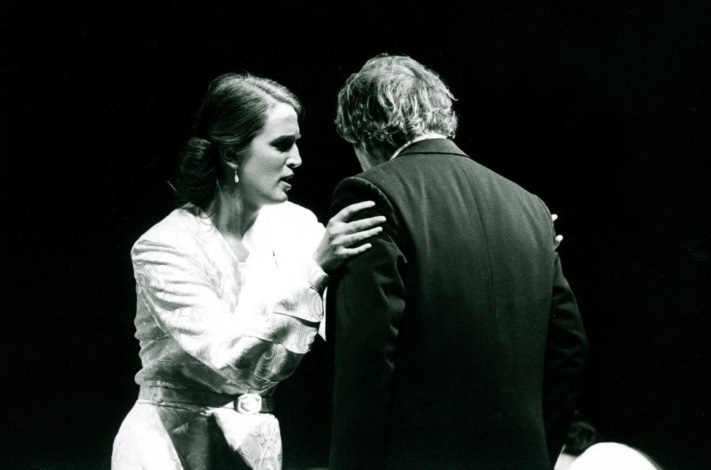 -If there's a single character at the centre of Lipsynch, it's Ada (Rebecca Blankenship), an opera singer who we first meet flying back from Germany to Canada after a performance of Gorecki's Third Symphony. ...Das Natürliche ist bei diesen Akteuren nicht undeutlich, sondern glasklar: Es freut ganz speziell das Wiedersehen mit Rebecca Blankenship, die eine wunderbar warmherzige Ausstrahlung hat und natürlich eine herrlich melancholische Stimme – ferner mit Hans Piesbergen, früher oft in Wien zu erleben. ...The show is divided into numbered "chapters", each named for one character whose story features prominently in it. The first, titled Ada - who is an opera singer (Rebecca Blankenship) - is 55 minutes of the most dramatic, intense, unexpected, beautiful and tragic theatre I have ever seen, anywhere. Set on a trans-Atlantic jet, the audience is introduced to characters that will thread through the rest of the piece. In the following chapters/acts, others who are more or less intimately connected to them are introduced and they all, like pinballs, are flipped hither and yon by each other and circumstances In truth, the following acts never reach the intensity of the first, but it would be impossible to maintain and probably constitute an extreme health hazard too. As it is, after Ada's story inexorably drags you in from the outside world, when "Interval" is announced, the audience files, shell-shocked and goggling, from the theatre and can hardly wait to get back to see what happens next. A little more conversation as Lipsynch analyses language Robert Lepage says: "Rebecca is an amazing actor, and while she's interested in psychology and doesn't negate it, she comes from that gutsy, dramatic soprano place, where they take the energy from the subtext of the music, a very abstract place to feed from," Lepage says. "Actors change when they perform with Rebecca. She brings that energy into the show and people go and feed there.